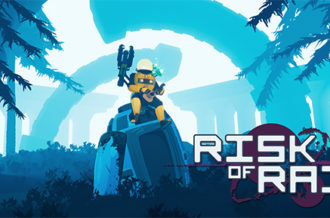 You probably knew this update was coming. Soon after the huge release of new Pokémon and Mega forms, even more news of them has come to light. 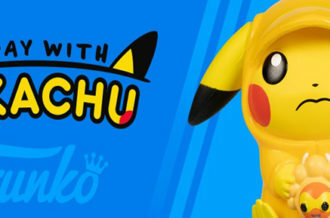 In a video posted today, the Pokémon Company announced English names, a new Pokémon and some customization features. Quilladin, the Spiny Armor Pokémon, is the evolved form of Chespin. Many fans have been in a bit of an uproar over its design. They don’t like the skinny little rodent turning into a fat wrecking ball of a Pokémon. But, that may be its saving grace. Based on appearance alone, it could turn into one of the strongest, sturdiest Pokémon of the sixth generation. Fennekin evolves into Braixen. Apparently, its name is a combination of the French word braise, meaning live coal and vixen, a female fox. Seeing the name makes it seem like a hulking monster and some people won’t like the absence of elegance. In the video, we see it using that stick that’s stuck in its fur. It waves it around with the tip lit like a torch. Froakie’s evolution is Frogadier. He’s a quick son of a gun and its name is a mix of frog and brigadier. With a military term it sounds tough and in-charge. There has been an interesting rumor around the web saying the starters are based off of different classes found in some games like Final Fantasy. The Chespin line is the Knight/Paladin/Fighter group. It does seem evident based on Chespin’s helmet-like head and Quilladin’s description as Spiny Armor. Fennekin is the Witch/Mage/Magician class. It uses psychic attacks and the stick used by Braixen is similar to a witch’s broom. Froakie is based on Thief/Rogue sort of characters. It’s fast when evolves and part of Frogadier’s Japanese name, Gekogashira, is a ranking in the Yakuza– a crime organization. Very interesting English names and so far many of their characteristics match that theory. Next we have the dinosaurs. Tyrunt is the T-Rex and with such a cute name it makes you want to pinch its rock-hard cheeks. Tyrunt is revived from the Jaw Fossil and is known as the Royal Heir Pokémon so we’re expecting quite an evolution. The Tyrannosaurus Rex is the king of lizards after all, should be something huge. The other fossil Pokémon is called Amaura. It may be based off Amartgasaurus, a slightly long-necked, spiny dinosaur. 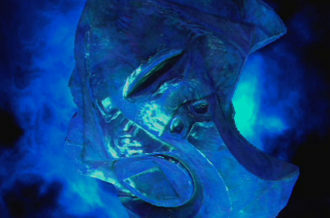 Amaura can be revived from the Sail Fossil which may give us a clue to an evolution having larger crest-like features. Furfrou is the French Poodle dog. Sounds snobby but it’s bite is worse than its bark. An interesting theory could involve its grooming feature. If Furfrou is the only Pokémon you can give haircuts or dye jobs then it may allow it to obtain different powers or abilities based on those styles. The yellow may give it an Electric-type power. 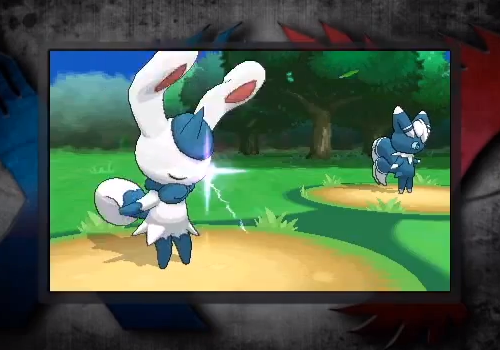 The two Pokémon with male and female differences are named Meowstic. It’s known as the Constraint Pokémon and they are formidable in double battles. After all those new guys were revealed, there was another who sneaked in late. 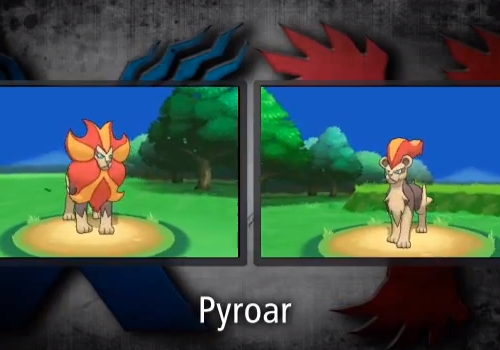 Pyroar, the evolution to Litleo, was first seen in a screenshot on IGN. At first nobody was quite sure if it was legit, but it’s been confirmed. Pyroar is the Royal Pokémon and a Fire/Normal-type. The video reveals a male and female form, the difference is all in the hair. Female Pyroar have a long ponytail of a mane. They will either have the abilities Rivalry or Unnerve which are pretty fitting for such beasts. 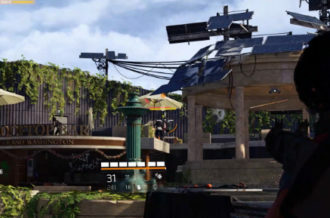 One of the last, possibly least interesting, parts of the video includes a customizable feature to your playable character. You can mix and match different outfits to show off your own unique style. 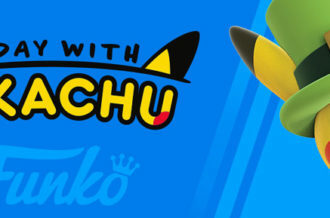 It’s a cool option to play around with especially since you can do the same with your Furfrou. It’s a first for the series to allow players the option of dressing however they want. Pokémon X and Y is less like the old titles and is looking toward a fresh beginning.